Location: On N2 from Montemor, Nr Evora, Alentejo. 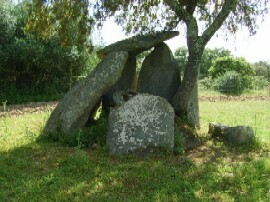 Grid Reference: 38° 45' 42" N, 8° 10' 52" W.
This partially collapsed dolmen stands by the side of the road on private land with a tree growing through it. 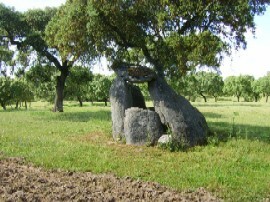 It was placed on a ridge by the Pombos river and is composed of seven stones (as are many of the Alentejo dolmens), and stands around 2.5m high. 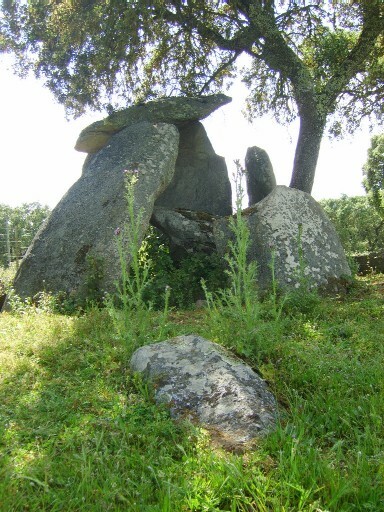 One feels that the Dolmen could have been placed higher up the ridge (for a better view maybe), but placing dolmens halfway up a hill is not uncommon in Portugal. It is likely that there was a good reason for its placement that might be determined at a later date. 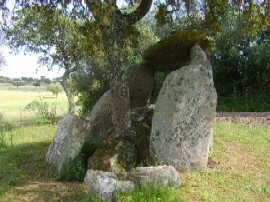 Cope (1), mentions that the Dolmen is situated on a natural outcrop of granite. 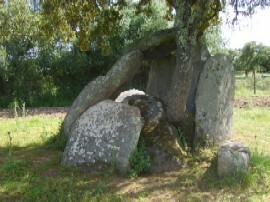 The orientation of this dolmen is approximately 110°, similar to many others in the Alentejo region of Portugal. This angle has suggested as being orientated to face the rising of the Pleiades . 1). J. Cope. The Megalithic European. 2004. Harper Collins.